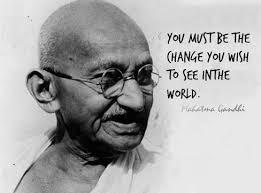 Gandhi’s words apply to our efforts to engage students in deep, meaningful, and lasting conversations. Whether you are a first-year teacher or a 30-year teacher, it is likely that you have been rocked by that unplanned classroom moment that can only be described as a spontaneous combustion of wonder, curiosity, and thoughtfulness that compelled you to run to a colleague to share the joy of that experience. So, how do you increase the likelihood that your classrooms, your Socratic Seminars, and your own conversations break out into spontaneous combustions of wonder, curiosity and thoughtfulness? It is simple, yet, profound. Become that all-important, truly interested listener. Isn’t this what you want your students to become? Well, become the change. Be fascinated in your kids, it pays dividends!